^ Spa-Francorchamps. Formula1.com. Formula One World Championship Limited. 2014 [2014-08-21]. （原始内容存档于2014-07-30）. ^ World Motor Sports Council. FIA.com. FIA. 2013-12-04 [2014-08-21]. ^ Daniel Ricciardo wins Belgian Grand Prix as Lewis Hamilton is forced to retire after collision with team-mate Nico Rosberg. Daily Mail. 2014-08-24 [2014-08-26]. ^ 4.0 4.1 4.2 4.3 Beglian Grand Prix - Preview 2014. FIA.com. Fédération Internationale de l'Automobile. 2014-08-20 [2014-08-25]. ^ Andre Lotterer replaces Kamui Kobayashi at Caterham F1 team. Autosport. Haymarket Publications. 2014-08-20 [2014-08-25]. ^ Rossi to replace Chilton at Marussia for Spa weekend. Formula1.com. Formula One Management. 2014-08-21 [2014-08-25]. ^ Galloway, James. Max Chilton to race in Belgian GP after all as Marussia U-turn on Alex Rossi decision. Sky Sports F1. BSkyB. 2014-08-22 [2014-08-25]. ^ 8.0 8.1 2014 Formula One Sporting Regulations (PDF). FIA.com. Fédération Internationale de l'Automobile. 2014-03-12 [2014-08-25]. ^ Codling, Stuart. Belgian GP: Nico Rosberg quickest in opening practice session. Autosport. Haymarket Publishing. 2014-08-22 [2014-08-25]. ^ Benson, Andrew. Belgian GP: Hamilton dominant in second practice at Spa. BBC Sport. British Broadcasting Corporation. 2014-08-22 [2014-08-25]. ^ Benson, Andrew. Lewis Hamilton beaten to pole by Nico Rosberg at Belgian GP. BBC Sport. British Broadcasting Corporation. 2014-08-23 [2014-08-25]. ^ Lewis Hamilton says Mercedes team-mate Nico Rosberg crashed into him on purpose in Belgian Grand Prix. Daily Telegraph. 2014-08-24 [2014-08-26]. ^ Daniel Ricciardo wins F1's Belgian GP as Hamilton-Rosberg spat reignites. The Guardian. 2014-08-24 [2014-08-26]. ^ 2014 FORMULA 1 SHELL BELGIAN GRAND PRIX. formula1.com (Formula One). 2014-08-23 [2014-08-23]. 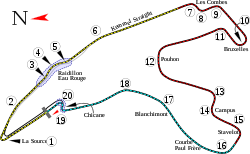 ^ 15.0 15.1 Belgian Grand Prix - Race. eurosport.yahoo.com. 2014-08-24 [2014-08-24].